FansBet are one of the most generous online betting sites in the gambling industry and if you’re looking for a bookie that offers a quality betting app, FansBet is definitely worth looking at. One reason as to why they are, is that their net profits are shared with the member of FansBet. This is a great competitive edge to have in order to show appreciation to players and attract new customers. As well as being a rewarding betting company, they have an awesome FansBet mobile betting app for customers to download on their mobile devices. The FansBet platform itself goes for a more modern, slick looking approach, which is carried through onto their mobile app. They have a range of markets, promotions and features that can all be experienced through their mobile betting app. The FansBet betting app is very spacious. A lot of betting companies try to replicate their website onto their app, so it looks the same. However, FansBet have not taken that approach, and instead have planned out how they think the app can look to be more user friendly. TO do this, they have rearranged parts of the platform and removed some parts to different areas, which frees up more space on the app for players to not be confused when they enter the FansBet mobile app, they don’t want to see information crammed everywhere, they want a simple looking app that’s easy to navigate. This is why every page is mobile optimized. As well as a well organised site, Fansbet also offer their full range of sporting markets. This includes all of the popular sports that players love to bet on. They have some amazing odds to go along with this. What makes these fixtures look even more appealing is the colour scheme of green and black. It is more appealing on the eye and different in comparison to other bookies. With our smartphones also being able to show HD content, it looks brilliant. When you load up the Fansbet app, the first thing you are greeted with is one of their special offers. It is a good way of ensuring that you don’t miss out on what they can provide you, as it may just be the offer that increases your winnings. For a betting company that doesn’t compete on the same level as Ladbrokes or William Hill, as of yet, they have done well to provide their customers with an array of bonus offers. There are new customer offers for players to claim, in relation to both sports betting and casino betting. On top of that, there are further promotions that existing customers can take a look at, that can take them that extra step further with their pay outs. 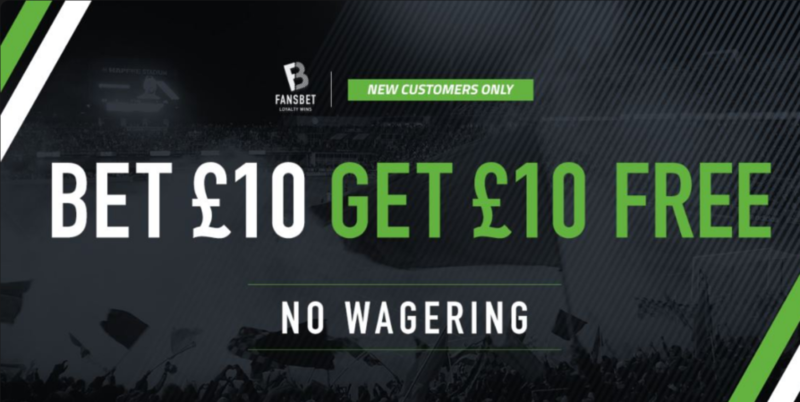 Starting with the welcome bonus, as a nice introduction into the FansBet app, new customers can get £10 in free bets when they bet £10. Of course, there are terms and conditions that come with this, which you can read through upon activating the bonus. This allows you to experience some of the sporting markets and the mobile app as a whole, with free funds. Acca Boost: Up to 100% increased winnings on your accumulator bets! Fans Boost: Chance to get enhanced winnings on a range of specials. Cashback Offer: On your first deposit, get a 5% cashback on deposits up to £20! Extra Places: On particular horse racing events, be able to receive a pay out on more places with E/W betting. For example, receive cash bonus for up to 6 places. FansBet understand and appreciate the popularity of Football betting, with it being one of the most common sporting markets for punters to bet on. They also see it as a chance to encourage more and more customers to place their football bets with them. That is why thy offer a great football betting section on their mobile app. If you choose the football tab in the category section, you will be taken to the page where all the football leagues are. These leagues are listed under different topics. There are the international leagues, as well as the top leagues, which include: Champions League, England – Premier League, Europa League, Champions League, Bundesliga, Serie A, Ligue 1. Also included in this you have the most popular specials, which are under “Liverpool Specials and Man United Specials. Then you have the “All Leagues” section, where you can find every single league to bet on, including ones you may have never even considered, such as “Bangladesh Champions League”. FansBet do often target some of their promotional offers towards football betting. For example, the free bets can be used on football betting. You may find the odd football specific promotion for an upcoming event. FansBet are in with tough competition against other bookmakers in terms of horse racing betting. Almost every bookmaker you come across will have some sort of promotion or inviting odds in relation to horse racing betting. FansBet try and stay competitive by offering an Extra Places bonus in relation to horse racing, where customers can receive pay outs on extra places on daily horse racing events. If you head over to the Horse Racing section of FansBet, you will notice that they have split it into 2 sections: “UK & Ireland” & “International”. They show the next 5 races that punters can enjoy betting on, with their odds and racing times. As well as this, players can see the race courses of the current and upcoming horse races. FansBet understand the popularity surrounding in-play betting, so much so that they have made their own tab at the top of the app that is specific to live betting. If you press this tab, you are taken to the in-play betting page. The following live betting sports include: Football, Tennis, Badminton, Basketball, Handball, Ice Hockey, Table Tennis, Volleyball. Under the list of sports, you will find all the upcoming fixtures that are either live now, or next available to bet live on. FansBet do have a cash out option that players can use on some bets. This allows them to receive an early pay out before the selection has even found its conclusion. This can be extremely helpful if you are worried about how your bet is going to pan out. The cash out option will be listed on your betting slip. The FansBet app is so simple for players to download. On the betting website itself, they explain to players where and how to download. There is in fact a “Download App” button available for customers to press and it will then take them straight to the app store. The app is available for iOS and Android. Use the iOS App Store or the Google Play store to find the app. There is no denying that the FansBet mobile app will not be the most popular betting app that players will download. There will be other bookmakers’ apps that customers will have a first thought about and will want to download because they offer more exciting bonuses. However, this is still a fully functioning mobile app and has some great bonuses and markets to experience. It has an easy to navigate betting app and it looks appealing on the eye. Therefore, if you are considering to sign up to a new bookmaker, maybe give this app a look over.